"Strategies of Occupation: Grabbing Land and The Political Agency of The Artist"
An online counterpart to the exhibition, the Web site features a selection of works drawn from submissions by artists working within the domain of claiming land. Landgrabonline.org is created in collaboration with the participatory art platform Wooloo.org. As real estate prices have skyrocketed throughout cities of the world, it has become increasingly difficult to sustain a place. Some artists' responses to this situation mirror those of many practitioners in the sixties and seventies who moved to the margins to seek out an abandoned or still undeveloped site to live and work on an expanded scale. 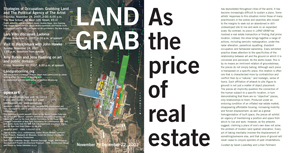 By contrast, no piece in LAND GRAB has involved a real estate transaction or finding that prime location. Instead, the show brings together a range of actions, including semiotic redesignation, under-the-radar alteration, parasitical squatting, dissident occupation and fantasized ownership. Every exhibited practice draws attention to the specificities of the relationship between art and the ground on which it is conceived and perceived. As the works reveal, this is by no means an imminent relation of groundedness; the pieces do not simply belong. Although each piece is transposed on a specific place, this relation is often one that is characterized more by contradiction and conflict than by a "natural," and nostalgic, sense of home. Each affiliation of artwork to site (figure to ground) is not just a matter of object placement. The pieces all implicitly question the connection of the human subject to a specific location, in turn demonstrating that there are no "objective" places, only relationships to them. Produced under an enduring condition of an inflated real estate market, disappearing affordable housing, increasing mobility and forced displacement, as well as a global homogenization of built space, the pieces all exhibit an urgency of maintaining a position and space from which to live and work. However, as the artworks suggest, claiming a place of one's own does not solve the problem of modern (and spatial) alienation. Every act of taking inevitably involves the displacement of something/someone else, and that piece of ground will never cease to conjure specters of past inhabitations. Lillian Fellmann is a curator and culture critic. Sarah Lookofsky is a critic and curator living in New York. This exhibition is supported in part by the Nordic Culture Fund and the Danish Arts Council. apexart’s exhibitions and public programs are supported in part by the Andy Warhol Foundation for the Visual Arts, Carnegie Corporation of New York, Foundation for Contemporary Arts, and with public funds from the New York City Department of Cultural Affairs, the New York State Council on the Arts.